This distinctive pitcher is made from an upcycled beer bottle adorned with gold leaf. This pitcher is a stellar example of the surprising beauty that can be achieved through upcycling—the process of transforming waste or surplus materials into beautiful and useful new objects. Glass artist Nanda Soderberg takes 22 ounce beer bottles bound for the recycling bin (or worse, the trash), and reshapes them into stately pitchers that retain only a hint of their past lives. 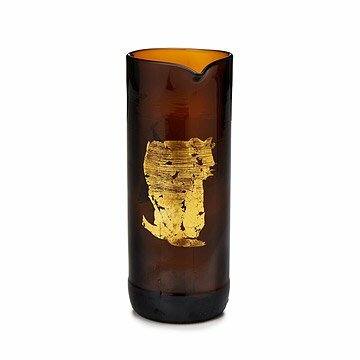 Soderberg cuts the bottles to the desired height, heats the vessel in a kiln to make it pliable enough to be reshaped into a bowl form, and heat-fuses gestural strokes of gold leaf to the surface of the glass. The resulting pitcher retains a fluidity that reflects the upcycling process, imbued with a preciousness through the interplay of glass and gold leaf. It makes a distinctive container for serving beverages, but also can be used as a striking vase for flowers. Handmade in Manchester, NH. Due to the handmade nature of this item, size and color may vary. Too small to use as pitcher of anything. Not worth anywhere near the price paid. Bought for wedding and not enough time to return . Had to go outlaws dhoo for something else last minute.